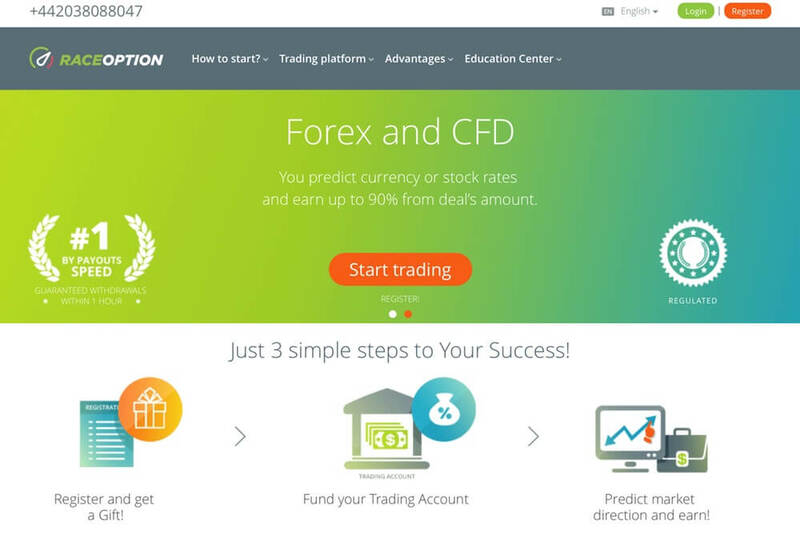 We have reviewed RaceOption that happens to be one of the premier binary options and FX & CFD brokerage company now. Binary options trading methods and strategies have gained a great deal of popularity of late. Traders around the globe are investing in binary options to earn higher profits. As a result, an increasing number of binary options brokers are now offering a wide range of services and assets that enables traders to make money through binary options trading. Race Option offers as many as hundred and fifty assets for trading including cryto currencies, stocks, commodities, indices and forex currencies. The broker offers attractive payouts and a wide range of funding as well as withdrawal options. Read on to find a comprehensive review about the broker. Race Option offers a fast, efficient and reliable trading platform to both new and experienced traders. The broker basically offers two different trading platforms including web and mobile. While, the web platform is highly advanced and easy to use. The web platform requires investors to simply pick an asset that they would prefer to trade and later choose the desired expiry time. The web version also provides traders with a chart that can be conveniently used for tracking the price movements of their selected asset. The mobile platform, on the other hand, is ideal for traders who prefer trading on the go. The mobile trading platform displays live charts and also offers instant trade execution to traders who do not have the time to access the broker’s website through their personal computers. RaceOption provide the ”copy trading ” technology where you can copy from the most successful users. The mobile version is available for iPhone and Android users and offers a smooth and interactive interface. It also supports trading features such as one touch trading and 60 second trading. Race Option offers an impressive range of assets to its traders. The broker offers more than 160 assets in different categories including commodities, indices, cyrpto currencies, forex and stocks. As a result, investors can trade in different markets and earn handsome profits on a regular basis. They offer the most popular crypto currencies to trade such as Bitcoin, Ethereum and Litecoin. Raceoption offers attractive payouts to the traders. Investors can expect as much as 90% return through the broker. Race Option offers optional bonuses up to 100% or free $250 Bonus to their traders. As a result, traders can expect a maximum bonus of €/$ 100000. The broker also offers additional bonuses to their clients. However, bonuses at race option are essentially optional. In fact, they’re granted after a client has given his/her confirmation. Clients who accept bonus erroneously must notify the broker within three working days and the broker shall remove the bonus from the trader’s account. The broker mainly offers three different types of trading account options to its clients including Bronze, Silver and Gold. The minimum deposit for opening a bronze account is $250 and offers features such as copy trading tool and demo account. On the other hand, the minimum amount required for opening a silver account is $1000 and the account offers exciting features such as demo account, copy trading, master class and individual account manager. For opening a Gold account, investors need to pay a minimum deposit amount of $3000. The account offers numerous attractive features such as integrated technical analysis, master class, copy trading tool and more. When it comes to funding their accounts, traders can choose from a wide variety of payment options including debit and credit cards, Neteller, Perfect Money, Ethereum, alts coins, Skrill etc. While, the broker does not charge any transfer fee, traders may have to pay third party fees. As far as withdrawals are concerned, Race Option offers quick, easy and hassle-free withdrawal process. In fact, withdrawals from all types of accounts does not exceed more than one hour. In order to withdraw money from their accounts, a trader must first place a request or give his/her confirmation. Race Option is renowned for providing impeccable customer support services to its clients in all parts of the globe. They offer 24×7 customer support services in different countries including USA, Germany, Canada, United Kingdom, Macao, France, Spain, Hong Kong, Israel, Singapore, Belgium, Turkey, United Arab Emirates, Japan and China. Traders can either connect with the broker through phone or send them an email query. Apart from this, raceoption also provides live chat option to its clients. In fact, live chat is the broker’s highly responsive and efficient features. 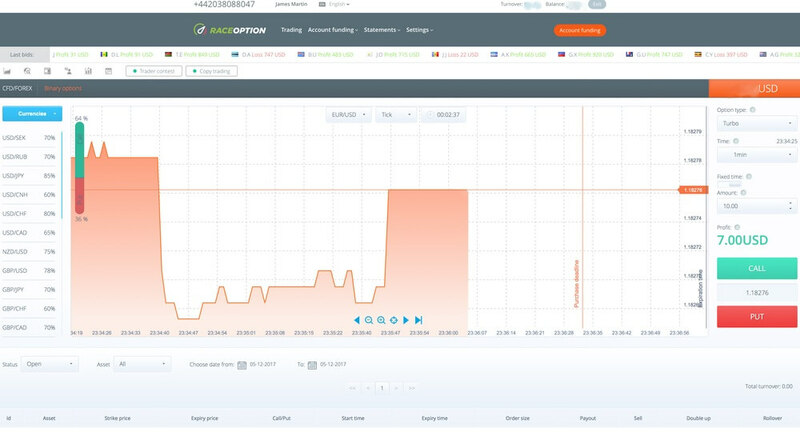 Traders can use the feature to not only connect with race option’s customer support representatives but also see them in real time. To sum up, Race Option is one of the finest binary options brokers operating in the market today. The brokerage, which came into existence in 2017, has done well to offer exciting trading options to traders from all walks of life. The broker offers a wide range of withdrawal and funding methods as well as secure and safe trading. Race Option is undoubtedly the best option for traders who seek quick withdrawals, good payouts, hassle-free and efficient trading options and features as well as a wide variety of assets for trading. Fantastic broker with wonderful customer service ( video chat ). I'm very happy with these guys. I do bitcoin trading with them. Had no problems with withdrawals.